Hi there! You may have heard that subsurface oceans have been hinted / discovered / confirmed for some major satellites of Jupiter and Saturn. What if bacteriological life existed there? Wait a minute… it is too early to speak about that. But anyway, these oceans are interesting, and the study I present you today, i.e. Ocean tidal heating in icy satellites with solid shells, by Isamu Matsuyama et al., discusses the response of these oceans to the tidal heating, in considering the icy shell coating the oceans. This study has recently been accepted for publication in Icarus. 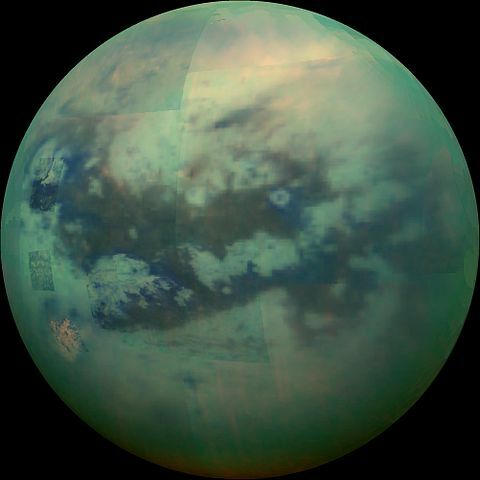 Titan is the largest satellite of Saturn, and is hinted since at least 30 years to have a global ocean. The spacecraft Cassini-Huygens has provided enough data to confirm this assumption, i.e. the variations of the gravity field of Titan, which are contained in a so-called tidal Love number k2, are too large for an oceanless body. a significant magnetic field, due to a subsurface conductive layer, i.e. an ocean. Ganymede has a strong magnetic field as well. Observations by the Hubble Space Telescope revealed in 2015 that the motion of auroras on Ganymede is a signature of that magnetic field as well, i.e. the internal ocean. Theoretical studies in fact suggest that there could be several oceanic layers, which alternate with water ice. We can see geysers at the surface of Enceladus, which reveal liquid water below the surface. 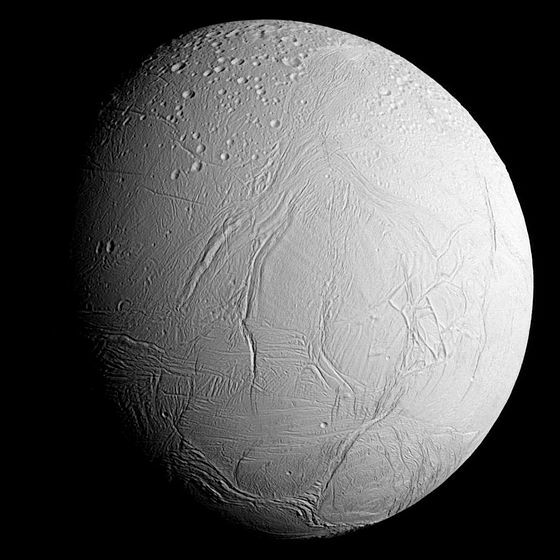 In particular, we know that Enceladus has a diapir at its South Pole. Cassini has proven by its gravity data that the ocean is in fact global. 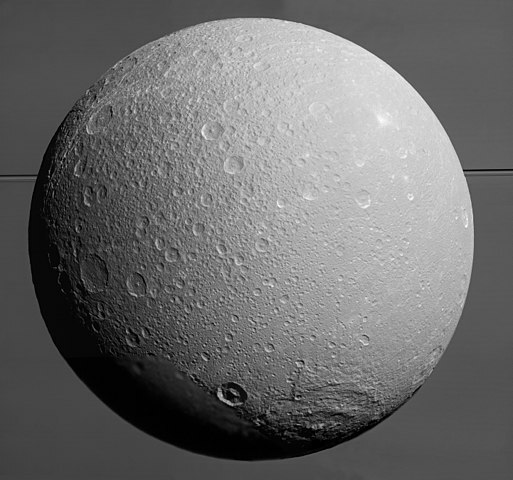 A recent theoretical study, led by Mikael Beuthe who also co-authors the present one, shows that Dione could not support its present topography if there were no subsurface ocean below the crust. The same methodology applied on Enceladus gives the same conclusion. In some sense, this validated the method. 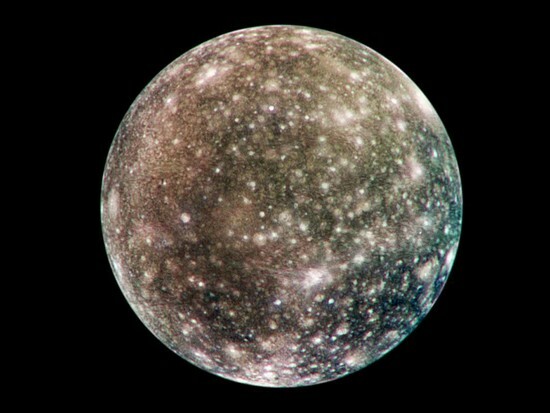 Measurements by Galileo suggest that the magnetic field of Jupiter does not penetrate into Callisto, which suggests a conductive layer, i.e. once more, an ocean. 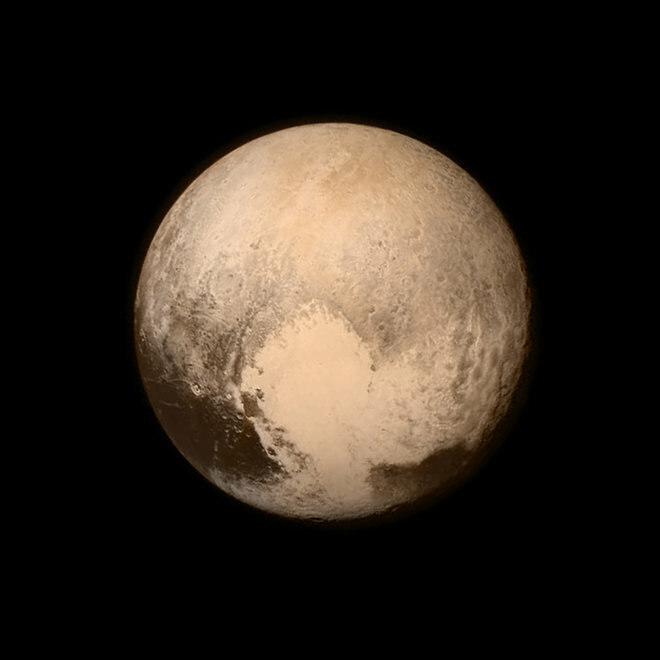 Pluto exhibits a white heart, Sputnik Planitia, which frozen material might originate from a subsurface ocean. Mimas is the innermost of the mid-sized satellites of Saturn. It is often compared to the Death Star of Star Wars, because of its large crater, Herschel. The surface of Mimas appears old, i.e. craterized, and frozen, so no heating is to be expected to sustain an ocean. 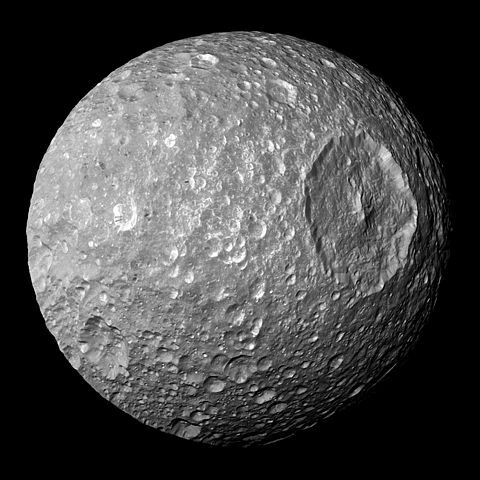 However, recent measurements of the diurnal librations of Mimas, i.e. its East-West oscillations, give too large numbers. This could be the signature of an ocean. Other oceanic worlds may exist, in particular among the satellites of Uranus and Neptune. Tides are the heating of a body by another, massive one, due to the variations of its gravitational action. For natural satellites, the tides are almost entirely due to the parent planet. The variations of the gravitational attraction over the volume of the satellite, and their time variations, generate stress and strain which deform and heat the satellite. The time-averaged tide will generate an equilibrium shape, which is a triaxial ellipsoid, while the time variations heat it. The time variations of the tides are due to the variations of the distance between a satellite element and the planet. And for satellites, which rotate synchronously, two elements rule these variations of distance: the orbital eccentricity, and the obliquity. For solid layers, rheological models give laws ruling the tidal response. However, the problem is more complex for fluid layers. Gravity waves: when a body moves on its orbit, the ocean moves, but the gravity of the body acts as a restoring force. This way, it generates gravity waves. Rossby-Haurwitz waves: these waves are generated by the rotation of the body, which itself is responsible for the Coriolis force. A wave has a specific velocity, wavelength, period… and if you excite it at a period which is close to its natural period of oscillation, then you will generate a resonant amplification of the response, i.e. your wave will meet a peak of energy. All this illustrates the complexity of resolving such a problem. Solving this problem requires to write down the equations ruling the dynamics of the fluid ocean. The complete equations are the Navier-Stokes equations. Here the authors used the Laplace tidal equations instead, which derive from Navier-Stokes in assuming a thin ocean. This dynamics depends on drag coefficients, which can only be estimated, and which will rule the dissipation of energy in the oceans. Let us go to the results instead. The authors applied their model to Europa and Enceladus. They find that eccentricity tides give a higher amplitude of deformation, but the obliquity tides give a higher phase lag, because the the Rossby-Haurwitz waves, that the eccentricity tides do not produce. For instance, and here I cite the abstract of the paper If Europa’s shell and ocean are respectively 10 and 100 km thick, the tide amplitude and phase lag are 26.5 m and <1° for eccentricity forcing, and <2.5 m and <18° for obliquity forcing. The expected NASA mission Europa Clipper should be able to detect such effects. However, no space mission is currently planned for Enceladus. I have a personal comment: for Mimas, a phase lag in libration of 6° has been measured. Could it be due an internal ocean? This probably requires a specific study. and the one of Shunichi Kamata. Hi there! You may know that the space missions to the systems of giant planets have revealed that the surface of several of theirs satellites are fractured. We dispose of images of such structures on Jupiter’s Europa and Ganymede, Saturn’s Enceladus (the famous tiger stripes at its South Pole), and even on Uranus’ Miranda, which has been visited by Voyager II. These satellites are thought to be icy bodies, with an icy crust enshrouding a subsurface, global ocean (maybe not for Miranda, but certainly true for the other guys). The study I present you today, Experimental constraints on the fatigue of icy satellite lithospheres by tidal forces, by Noah P. Hammond, Amy C. Barr, Reid F. Cooper, Tess E. Caswell, and Greg Hirth, has recently been accepted for publication in Journal of Geophysical Research: Planets. The authors particularly tried to produce in labs the process of fatigue, which would weaken a material after a certain number of solicitations, i.e. it would become easier to break. The Galilean satellite of Jupiter Europa may be the most interesting satellite to focus on, since it is the most fractured, at least to the best of our knowledge. 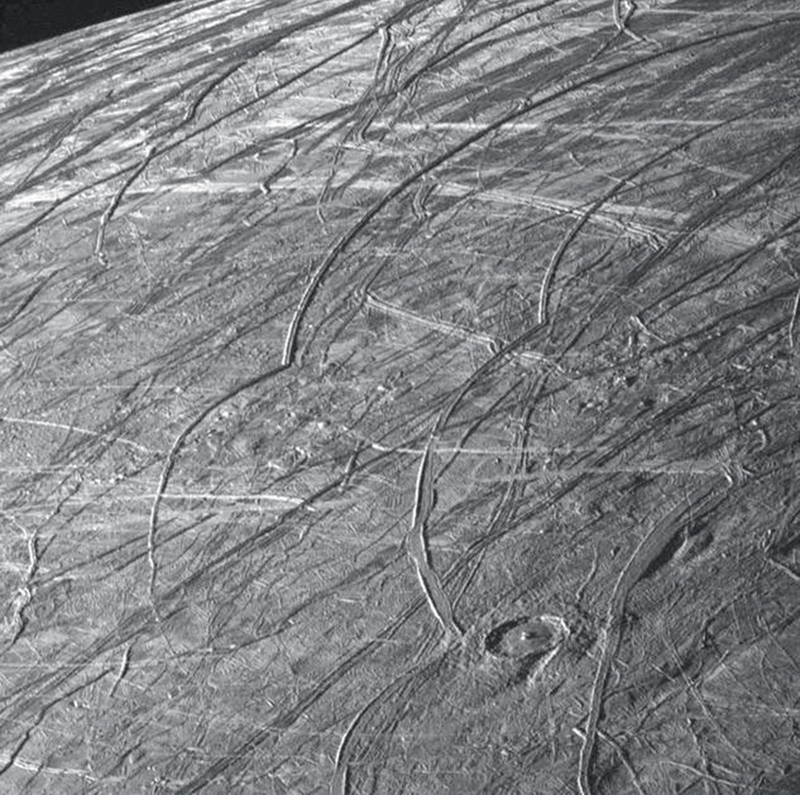 The observation of the surface of Europa, first by Voyager I and II in 1979, and after by Galileo between 1995 and 2003, revealed many structures, like lineae, i.e. cracks, due to the geophysical activity of the satellite. This body is so active that only few craters are visible, the surface having been intensively renewed since the impacts. Something particularly appealing on Europa is that some of these lineae present a cycloidal pattern, which would reveal a very small drift of the orientation of the surface. Some interpret it has an evidence of super-synchronous rotation of Europa, i.e. its rotation would not be exactly synchronous with its orbital motion around Jupiter. Beside Europa, fractures have also been observed on Ganymede, but with less frequency. For having such fractures, you need the surface to be brittle enough, so that stress will fracture it. This is a way to indirectly detect a subsurface ocean. But you also need the stress. And this is where tides intervene. You can imagine that Jupiter exerts a huge gravitational action on Europa. But Europa is not that small, and its finite size results in a difference of Jovian attraction between the point which is the closest to Jupiter, and the furthest one. The result of this differential attraction is stress and strain in the satellite. The response of the satellite will depend on its structure. A problem is that calculations suggest that the tidal stress may be too weak to generate alone the observed fractures. This is why the authors suggest the assistance of another phenomenon: fatigue crack growth. The picture is pretty intuitive: if you want to break something… let’s say a spoon. You twist it, bend it, wring it… once, twice, thrice, more… Pretty uneasy, but you do not give up, because you see that the material is weakening. And finally it breaks. Yes you did it! But what happened? You slowly created microcracks in the spoon, which weakened it, the cracks grew… until the spoon broke. For geophysical materials, it works pretty much the same: we should imagine that the tides, which vary over an orbit since the eccentricity of the orbit induces variations of the Jupiter-Europa distance, slowly create microcracks, which then grow, until the cracks are visible. To test this scenario, the authors ran lab experiments. The lab experiments consisted of Brazil Tests, i.e. compression of circular disks of ice along their diameter between curved steel plates. The resulting stress was computed everywhere in the disk thanks to a finite-element software named Abaqus, and the result was analyzed with acoustic emissions, which reflections would reveal the presence of absence of microcracks in the disk. The authors ran two types of tests: both with cyclic loading, i.e. oscillating loading, but one with constant amplitude, and the other one with increasing amplitude, i.e. a maximum loading becoming stronger and stronger. But wait: how to reproduce the conditions of the real ice of these satellites? Well, there are things you cannot do in the lab. Among the problems are: the exact composition of the ice, the temperature, and the excitation frequency. The authors bypassed these two problems in constraining the product frequency times viscosity to be valid, the viscosity itself depending on the temperature. This resulted in an excitation period of 1 second, and temperatures between 198 and 233 K (-75 to -40°C, or -103 to -40°F). The temperature was maintained thanks to a liquid nitrogen-cooled, ethanol bath cryostat. Indeed, the authors observed no fatigue, i.e. no significant microcracks were detected, which would have altered the material enough, to weaken it. This prompted the authors to discuss the application of their experiments for understanding the crust of the real satellites, and they argue that fatigue could be possible anyway. As the authors recall, these experiments are not the first ones. Other authors have had a negative result with pure water ice. However, fatigue has been detected on sea ice, which could mean that the presence of salt favors fatigue. And the water ice of icy satellite may not be pure. Salt and other chemical elements may be present. So, even if these experiments did not reveal fatigue, there may be some anyway. But the motivation for investigating fatigue is that a process was needed to assist the tides to crack the surface. Why necessarily fatigue? Actually, other processes may weaken the material. The explanation is like the most (just a matter of taste) is impacts: when you impact the surface, you break it, which necessarily weakens it. And we know that impacts are ubiquitous in the Solar System. In case of an impact, a megaregolith is created, which is more likely to get fractured. The authors also suggest that the tides may be assisted, at least for Europa, by the super-synchronous rotation possibly suggested by the geometry of the lineae (remember, the cycloids). Another possibility is the large scale inhomogeneities in the surface, which could weaken it at some points. Anyway, it is a fact that these surfaces are fractured, and the exact explanation for that is still in debate! You can find the study here, or freely on arXiv or on ResearchGate, many thanks to the authors for sharing! and the webpage of Greg Hirth. Hi there! Jupiter has 4 large satellites, known as Galilean satellites since they were discovered by Galileo Galilei in 1610. Among them is Europa, which ocean is a priority target for the search for extraterrestrial life. Many clues have given us the certainty that this satellite has a global ocean under its icy surface, and it should be the target of a future NASA mission, Europa Clipper. Meanwhile it will also be visited by the European mission JUICE, before orbital insertion around Ganymede. Since Europa presents evidences of tectonic activity, the study I present you today, i.e. Porosity and salt content determine if subduction can occur in Europa’s ice shell, by Brandon Johnson et al., wonders whether subduction is possible when two plates meet. This study has been conducted at Brown University, Providence, RI (USA). I guess you know about place tectonics on Earth. The crust of the Earth is made of several blocks, which drift. As a consequence, they collide, and this may be responsible for the creation of mountains, for earthquakes… Subduction is a peculiar kind of collision, in which one plate goes under the one it meets, just because their densities are significantly different. The lighter plate goes up, while the heavier one goes down. This is what happens on the west coast of South America, where the subduction of the oceanic Nazca Plate and the Antarctic Plate have created the Andean mountains on the South America plate, which is a continental one. Even if our Earth is unique in the Solar System by many aspects, it is highly tempting to use our knowledge of it to try to understand the other bodies. This is why the authors simulated the conditions favorable to subduction on Europa. Europa is the smallest of the four Galilean satellites of Jupiter. It orbits Jupiter in 3.55 days at a mean distance of 670,000 km, on an almost circular and planar orbit. It has been visited by the spacecraft Pioneer 10 & 11 in 1973-1974, then by Voyager 1 & 2 in 1979. But our knowledge of Europa is mostly due to the spacecraft Galileo, which orbited Jupiter between 1995 and 2003. It revealed long, linear cracks and ridges, interrupted by disrupted terrains. The presence of these structures indicates a weakness of the surface, and argues for the presence of a subsurface ocean below the icy crust. Another argument is the tidal heating of Jupiter, which means that Europa should be hot enough to sustain this ocean. This active surface shows extensional tectonic feature, which suggests plate motion, and raises the question: is subduction possible? To determine whether subduction is possible, the authors performed one-dimensional finite-elements simulations of the evolution of a subducted slab, to determine whether it would remain below another plate or not. The equation is: would the ocean be buoyant? If yes, then the slab cannot subduct, because it would be too light for that. The porosity: Planetary ices are porous material, but we do not know to what extent. In particular, at some depth the material is more compressed, i.e. less porous than at the surface, but it is not easy to put numbers behind this phenomenon. Which means that the porosity is a parameter. The porosity is defined as a fraction of the volume of voids over the total volume investigated. Here, total volume should not be understood as the total volume of Europa, but as a volume of material enshrouding the material element you consider. This allows you to define a local porosity, which thus varies in Europa. Only the porosity of the icy crust is addressed here. The salt content: the subsurface ocean and the icy crust are not pure ice, but are salty, which affects their densities. The authors assumed that the salt of Europa is mostly natron, which is a mixture essentially made of sodium carbonate decahydrate and sodium bicarbonate. Importantly, the icy shell has probably some lateral density variations, i.e. the fraction of salt is probably not homogeneous, which gives room for local phenomenons. The crust thickness: barely constrained, it could be larger than 100 km. The geometry of the slab, in particular the bending radius, and the dip angle. And once you have modeled and simulated all this, the computer tells you under which conditions subduction is possible. The first result is that the two critical parameters are the porosity and the salt content, which means that the conditions for subduction can be expressed with respect to these two quantities. Regarding the conditions for subduction, let me quote the abstract of the paper: If salt contents are laterally homogeneous, and Europa has a reasonable surface porosity of 0.1, the conductive portion of Europa’s shell must have salt contents exceeding ~22% for subduction to occur. However, if salt contents are laterally heterogeneous, with salt contents varying by a few percent, subduction may occur for a surface porosity of 0.1 and overall salt contents of ~5%. A possible subduction does not mean that subduction happens. For that, you need a cause, which would trigger activity in the satellite. Tidal interaction with Jupiter, enhanced by non-synchronous rotation: Surface features revealed by Galileo are consistent with a crust which would not rotate synchronously, as expected for the natural satellites, but slightly faster, the departure from supersynchronicity inducing a full rotation with respect to the Jupiter-Europa direction between 12,000 and 250,000 years… to be compared with an orbital period of 3.55 days. So, this is a very small departure, which would enhance the tidal torque of Jupiter, and trigger some activity. This interpretation of the surface features as a super-synchronous rotation is controversial. Convection, i.e. fluid motion in the ocean, due to the variations of temperature. No doubt Europa Clipper and maybe JUICE will tell us more! The study, made freely available to you by the authors, who paid for Open Access. Thanks to them! You can also find a preliminary version in this conference abstract. the one of Alyssa C. Pascuzzo. Hi there! Today the release of the paper Classification of satellite resonances in the Solar System, by Jing Luan and Peter Goldreich, is the opportunity for me to present you the mean-motion resonances in the system of satellites of the giant planets. That paper has recently been published in The Astronomical Journal, but the topic it deals with is present in the literature since more than fifty years. This is why I need to detail some of the existing works. Imagine that you have a planet orbited by two satellites. In a convenient case, their orbits will be roughly elliptical. The ellipse results from the motion of a small body around a large spherical one; deviations from the exact elliptical orbit come from the oblateness of the central body and the gravitational perturbation of the other satellite. If the orbital frequencies of the two satellites are commensurate, i.e. if Satellite A accomplishes N revolutions around the planet, while Satellite B accomplishes (almost exactly) M revolutions, i.e. M orbits, N and M being integers, then the 2 satellites will be in a configuration of mean-motion resonance. It can be shown that the perturbation of A on B (respectively of B on A) will not average to 0 but have a cumulative effect, due to the repetition, at the same place, of the smallest distance between the two bodies, the smallest distance meaning the highest gravitational torque. A consequence of a MMR is the increase of the eccentricity of one of the satellites, or of both of them, and / or their inclinations… or only the inclination of one of them. In the worst case, this could result in the ejection of one of the satellites, but it can also have less catastrophic but not less interesting consequences, like the heating of a body, and the evolution of its internal structure… We will discuss that a little later. Saying that the Satellites A and B are in a MMR means that there is an integer combination of orbital elements, such as φ=pλA-(p+q)λA+q1ϖA+q2ϖB+q3ΩA+q4ΩB, which is bounded. Usually an angle is expected to be able to take any real value between 0 and 2π radians, i.e. between 0 and 360°, but not our φ. The order of the resonance q is equal to q1+q2+q3+q4, and q3+q4 must be even. Moreover, it stems from the d’Alembert rule, which I will not detail here, that a strength can be associated with this resonance, which is proportional to eAq1eBq2iAq3iBq4. This quantity also gives us the orbital elements which would be raised by the resonance. 2λA-4λB+2ΩA+ΩB (order 2), which would force iA and iB. Higher-order resonances could be imagined, but let us forget them for today. The next two figures give a good illustration of the way the resonances can raise the orbital elements. All of the curves represent possible trajectories, assuming that the energy of the system is constant. The orbital element which is affected by the resonance, can be measured from the distance from the origin. And we can see that the trajectories tend to focus around points which are not at the origin. These points are the centers of libration of the resonances. This means that when the system is at the exact resonance, the orbital element relevant to it will have the value suggested by the center of libration. These plots are derived from the Second Fundamental Model of the Resonance, elaborated at the University of Namur (Belgium) in the eighties. The Second Fundamental Model of the Resonance for order 1 resonances, for different parameters. On the right, we can see banana-shaped trajectories, for which the system is resonant. The outer zone is the external circulation zone, and the inner one is the internal circulation zone. Inspired from Henrard J. & Lemaître A., 1983, A second fundamental model for resonance, Celestial Mechanics, 30, 197-218. The Second Fundamental of the Resonance for order 2 resonances, for different parameters. We can see two resonant zones. On the right, an internal circulation zone is present. Inspired from Lemaître A., 1984, High-order resonances in the restricted three-body problem, Celestial Mechanics, 32, 109-126. Here, I have only mentioned resonances involving two bodies. We can find in the Solar System resonances involving three bodies… see below. It appears, from the observations of the satellites of the giant planets, that MMR are ubiquitous in our Solar System. This means that a mechanism drives the satellite from their initial position to the MMRs. When the satellites are not in MMR, the argument φ circulates, i.e. it can take any value between 0 and 2π. Moreover, its evolution is monotonous, i.e. either constantly increasing, or constantly decreasing. However, when the system is resonant, then φ is bounded. It appears that the resonance zones are levels of minimal energy. This means that, for the system to evolve from a circulation to a libration (or resonant zone), it should loose some energy. Capture into a resonance is actually a probabilistic process. If you cross a resonance without being trapped, then your trajectories jump from a circulation zone to another one. However, if you are trapped, you arrive in a libration zone, and the energy dissipation can make you spiral to the libration center, forcing the eccentricity and / or inclination. It can also be shown that a resonance trapping can occur only if the orbits of the two satellites converge. Io, Europa and Ganymede are locked into the Laplace resonance. This is a 3-body MMR, which resonant argument is φ=λ1-3λ2+2λ3. It librates around π with an amplitude of 0.5°. This Laplace resonance is a unique case in the Solar System, to the best of our current knowledge. It is favored by the masses of the satellites, which have pretty the same order of magnitude. Moreover, Io shows signs of intense dissipation, i.e. volcanism, which were predicted by Stanton Peale in 1979, before the arrival of Voyager I in the vicinity of Jupiter, from the calculation of the tidal effects. Besides the well-known rings and a collection of small moons, Saturn has 8 major satellites, i.e. and resonant relations, see the following table. The amplitude of the libration tells us something about the age of the resonance. Dissipation is expected to drive the system to the center of libration, where the libration amplitude is 0. However, when the system is trapped, the transition from circulation to libration of the resonant argument φ induces that the libration amplitude is close to π, i.e. 180°. So, the dissipation damps this amplitude, and the measured amplitude tells us where we are in this damping process. This study aims at reinvestigating the mean-motion resonances in the systems of Jupiter and Saturn in the light of a quantity, kcrit, which has been introduced in the context of exoplanetary systems by Goldreich & Schlichting (2014). This quantity is to be compared with a constant of the system, in the absence of dissipation, and the comparison will tell us whether an inner circulation zone appears or not. In that sense, this study gives an alternative formulation of the results given by the Second Fundamental Model of the Resonance. The conclusion is that the resonances should be classified into two groups. The first group contains Mimas-Tethys and Titan-Hyperion, which have large libration amplitudes, and for which the inner circulation zone exists (here presented as overstability). The other group contains the resonances with a small amplitude of libration, i.e. not only Enceladus-Dione, but also Io-Europa and Europa-Ganymede, seen as independent resonances. Io-Europa and Europa-Ganymede are not MMR, and they are not independent pairs. They actually constitute the Io-Europa-Ganymede resonance, which is much less documented than a 2-body resonance. An extensive study of such a resonance would undoubtedly be helpful. The paper, i.e. Luan J. & Goldreich P., 2017, Classification of satellite resonances in the Solar System, The Astronomical Journal, 153:17. The web page of Jing Luan at Berkeley. The web page of Peter Goldreich at Princeton. The Second Fundamental Model of the Resonance, for order 1 resonances and for higher orders. A study made in Brazil by Nelson Callegary and Tadashi Yokoyama, on the same topic: Paper 1 Paper 2, also made available by the authors here and here, thanks to them for sharing!. Hi there! Today I will present you a paper that has recently been accepted for publication in Celestial Mechanics and Dynamical Astronomy, entitled Constraints on dissipation in the deep interiors of Ganymede and Europa from tidal phase-lags. This study has been conducted in Germany, at the DLR, by Hauke Hussmann. The idea is here to get some clues on the interior of the satellites of Jupiter Ganymede and Europa, from two different signatures of the tides raised by Jupiter. I have recently presented the tidal Love number k2 in a post on Mercury. In a nutshell: it represents the amplitude of variation of the gravity field of the satellite, at the orbital frequency. Please note that contrary to Mercury, only the orbital frequency is to be considered in the periodic variations of the gravity field. The reason for that is in the rotational dynamics: the main satellites of Jupiter rotate synchronously, showing the same face to their planet like our Moon, while Mercury is in a 3:2 spin-orbit resonance. The tidal Love number h2 represents the amplitude of the tidal deformation of the topography of the satellite. Something remarkable on these 2 numbers is that h2 is mostly sensitive to the surface, while k2 is the response of the whole body. The idea of this study is to compare the two numbers, to get clues on the interior. The inner satellites Metis, Adrastea, Amalthea and Thebe. These are small bodies, their mean radii being between 8 and 85 km. They orbit at less than 3 Jupiter radii. The Galilean satellites Io, Europa, Ganymede and Callisto. These are pretty large bodies, which were discovered in 1610 by Galileo Galileo. They orbit between 6 and 25 Jupiter radii. They contain almost of the mass of the satellites of Jupiter, which make them particularly interesting. For instance, their large masses is responsible for an interesting 3-bodies mean-motion resonance involving Io, Europa, and Ganymede. Basically, Io makes 4 revolutions around Jupiter while Europa makes 2 and Ganymede exactly one. This configuration is known as Laplacian resonance. Moreover the sizes of the 4 Galilean satellites, combined with the tides raised by Jupiter, are also responsible for internal differentiation. In particular, these 4 bodies are all considered to harbor global internal fluid layers. The irregular satellites. These are small bodies orbiting far much further from Jupiter. They are probably former asteroids which were trapped by the gravity field of Jupiter. Contrary to the two other groups, which have pretty circular and coplanar orbits, the irregular satellites can have highly eccentric and inclined orbits. Some of them are even retrograde. Ganymede and Europa are the main targets of the next two missions to the system of Jupiter. These two missions are the ESA mission JUICE, and the NASA Europa Mission. JUICE, for JUpiter ICy moons Explorer, is planned to be launched in 2022 and to orbit Jupiter in 2030. Then, it will make flybys of Europa and Callisto, before becoming a satellite of Ganymede. 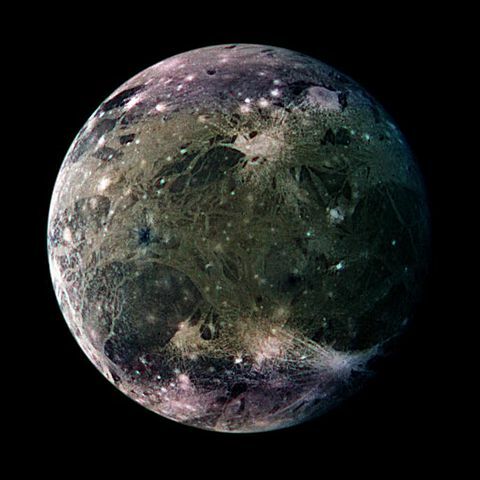 Ganymede is thus the main target. Among the 11 instruments constituting JUICE, let us focus on two of them: GALA and 3GM. GALA, for GAnymede Laser Altimeter, will measure the topography of the planet, while 3GM, for Gravity and Geophysics of jupiter and the Galilean Moons, is the radioscience experiment. It will in particular measure the gravity field of the body. The connection with the study I am presenting you is that h2 is expected from GALA, while k2 is expected from 3GM. Another connection is that Hauke Hussmann is both the first author of this study, and the principal investigator of GALA. The NASA Europa Mission, also known as Europa Multiple-Flyby Mission, and previously Europa Clipper, will obviously target Europa. It should be launched in the 2020’s, and the nominal mission plans to perform 45 flybys of Europa. The idea of these studies is to compare the Love number h2, from the topography, and k2, from the gravity field, to constrain the interior. For that, the authors have considered several models of interior of Europa and Ganymede, and simulated the resulting Love numbers. These interior models have to be realistic, which means being consistent with our current knowledge of these bodies, i.e. their total mass and their shapes, and being physically relevant. This implies that their densities increase radially, from the surface to the center. So, the surface is assumed to be made of ice coating a water ocean. Below the ocean is another ice layer, which itself surrounds a denser core. The ocean tends to decouple the icy shell from the action of the interior. The authors particularly focus on the phase difference between h2 and k2. Basically, the Love numbers are complex numbers, the imaginary part representing the dissipation, while the real part is related to a purely elastic tide. From their simulations, they show that these phase differences should be of several degrees. Their possible measurements should constrain the viscosity of the ice shell coating the core of Ganymede, and the temperature of the mantle of Europa. The authors assumed the rotations of these satellites to be synchronous, as suggested by the theory. But features at the surface of Europa suggest that the rotation of its surface could be actually slightly super-synchronous. This is something that the dynamical theories still need to understand, but this would probably affect the tidal action of Jupiter on Europa. A related poster by Steinbrügge et al.